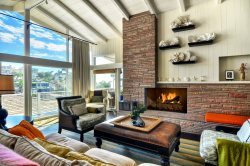 LA VISTA is Your Premier Vacation Rental Condominium destination in Laguna Niguel! La Vista is the perfect vacation rental for your family vacation, short-term housing needs, or corporate housing rental. Newly remodeled with luxurious upgrades and furnishings, La Vista is perfectly appointed for a quiet rendezvous for two, a relaxing beach vacation with the family, or a short term work stay. Are you the Active Type? LA VISTA'S clubhouse is outfitted with a professionally equipped workout room and jr. olympic size pool to swim laps. Tennis anyone? Bring your racquet! Walk to the Tennis Villas. The Tennis Villas is a professional tournament style tennis club and resort offering weekly and monthly passes to our out of town guests (for an additional fee). The Tennis Villas also offers a pool, spay, gym, and lounge. For additional information please see The Tennis Villas website. Bring Your Golf Clubs! The Links at Monarch Beach Resorts at The St. Regis Resorts is open to the public and very affordable! Take in the ocean breezes and sweeping vistas while enjoying a relaxing game of golf… it doesn’t get much better than that! For additional information please see The St Regis Golf website. Hillside Views and Gentle Ocean Breezes greet you as enter your private retreat. La Vista is located just 3 miles from the beach. Bicycle and jogging paths lead to Salt Creek Beach, and a quick turn south put you on the doorstep of the Ritz-Carlton and the St. Regis. Just a bit further south and you’ll find Dana Point Harbor with shopping, restaurants, beaches, sailing, and entertainment. La Vista is also just a quick 20 minute drive into Aliso Viejo or Irvine making La Vista is the ideal location for a short term work stay or family vacation spot! Laguna Niguel’s temperate climate is the perfect rental location for a month (or more) stay for those Snowbirds wishing to make that much needed escape. The resort style pool, spa, and clubhouse with workout provide ample opportunity to relax in style. Enjoy that perfect cup of coffee or an evening nightcap while enjoying the amazing California sunsets from the bistro style patio. It’s also a quiet spot to enjoy the outdoors with your favorite book.